As we have said before, WordPress provides two primary content types for you two work with: posts and pages. Posts are marked with a timestamp, and are displayed in reverse-chronological order on your blog’s front page by default. They can be easily grouped and displayed based on author, category, or tag. 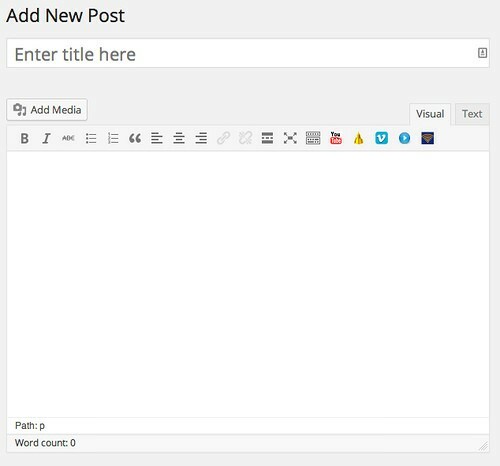 Posts also appear in your blog’s RSS feed, which you can use to automatically publish your writing on multiple sites. RSS can also be used by visitors to automatically subscribe to your blog, so they can read your posts without having to directly visit your site. Posts might be what you use to share your regular thoughts, reflections, or ideas about a topic. Example: If you were using WordPress to build a business Web site with a lot of information content, you would probably use Pages. If you added a feature to that site where you started to advertise special events or news, you would probably use Posts. Pages, are a more static form of content. Pages are marked with a timestamp, but are not displayed based on chronology, and cannot be grouped by author, category, or tag. Pages do not appear in your blog’s RSS feed, so they cannot be published automatically to other sites, and visitors must come directly to your blog to read pages. They are more likely to stand alone and be organized according to a traditional hierarchy. Pages might be content that is less frequently updated or changed. A static front page is sometimes a good idea if you want users of your blog/website to see a different landing page first. This way they are not just going right into the default or latest posts of your blog or website. This can be particularly helpful if you would like them to get some background information about your site or see something before they go straight into your blog. Pages are additional areas to put information that don’t change very often. If you are using ODU WordPress as part of a course, you will most likely be asked to write posts for the majority of your work, although some courses do also use pages for certain assignments. When in doubt, check the syllabus, or ask your classmates or professor for clarification. For some courses, you will need to create a page on your own personal blog; for others, you will need to create a page directly on the main course blog. Make sure you are on the correct Dashboard by looking in the menu across the top. If you are not in the right Dashboard, use the My Sites drop-down menu to go to the correct Dashboard. 1) From the left sidebar, go to Pages → Add New. 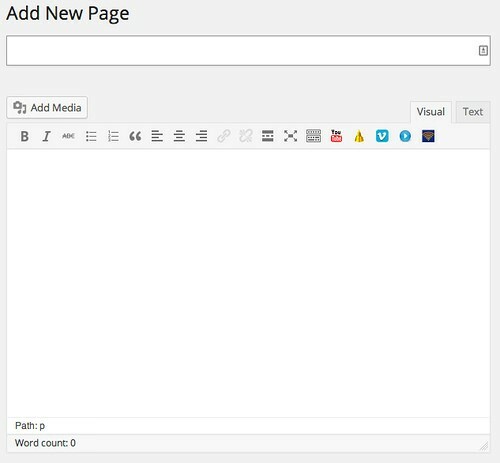 2) In the Add New Page editing area, enter a title for your page. Be descriptive! You may be asked to include specific items in your page titles. When in doubt, consult the syllabus, ask a classmate, or check with the professor. 3) Type the content for your page into the larger text box. It’s best to compose your text directly in the browser window, if possible. If you are pasting text from Microsoft Word, the visual editor will do its best to remove any extraneous formatting that may cause problems on your blog. 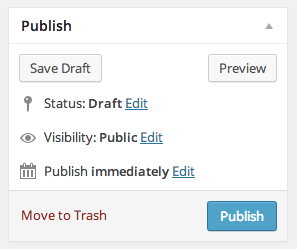 4) When you are finished, find and click the Publish icon near the top of the right sidebar. Your page will now appear on the site. For some courses, you will need to create a post on your own personal blog; for others, you will need to create a post directly on the main course blog. Make sure you are on the correct Dashboard by looking in the menu across the top. If you are not in the right Dashboard, use the My Sites drop-down menu to go to the correct Dashboard. 1) From the left sidebar, go to Posts → Add New. 2) In the Add Post editing area, enter a title for your post. Be descriptive, but not boring! Assignment #1, Paper #1, etc are NOT good titles. You may be asked to include specific items in your post titles, so when in doubt, consult the syllabus, ask a classmate, or check with the professor. 3) Type your post into the larger text box. It’s best to compose your text directly in the browser window, if possible. If you are pasting text from Microsoft Word, the visual editor will do its best to remove any extraneous formatting that may cause problems on your blog. 4) You may be asked to add certain tags or categories to your post. Scroll down the Add Post page and look for the Categories and Tags widgets on the right side. If the category you need has already been created, you can simply check the box next to the right category. Otherwise, click the Add New Category link and enter the category name. 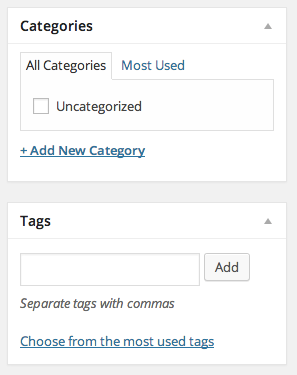 To see all existing tags on this blog, click the “Choose from the most used tags” link. If a tag that you want to use already exists, click on its name to apply it to your post. Otherwise, you can add tags by typing them into the box either one at a time or as a comma-separated list (e.g. summer, spring, fall) before clicking Add. When in doubt about what categories or tags to use, consult the syllabus, ask a classmate, or check with the professor. Overall categories and tags are an optional feature when it comes to the functionality of your site. 5) When you are finished, find and click the Publish icon near the top of the right sidebar. Your post will now appear on the site.